Max Scherzer, the reigning AL Cy Young Award winner, allowed five runs and seven hits in 5 2-3 innings with eight strikeouts and no walks. VIERA, Fla. (AP) — Had this been the regular season, Stephen Strasburg vs. Max Scherzer would have been a tantalizing matchup. 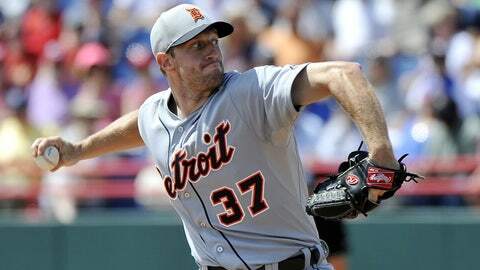 Strasburg allowed three hits and struck out five in five scoreless innings Thursday, helping the Washington Nationals beat the Detroit Tigers 8-1. Preparing for Washington’s opener at the New York Mets on March 31, Strasburg has given up one earned run and eight hits in 14 innings with 10 strikeouts and four walks. ‘I’m just trying to go out there and commit to every pitch and take what happens," Strasburg said. In addition to working on his slider, Strasburg has also been trying to do a better job of holding runners on base. That paid off in the third inning, when Washington catcher Wilson Ramos threw out Detroit’s Nick Catellanos trying to steal second. "The biggest thing for me is just being aware of how far off the bag he is and being able to identify the leads," Strasburg said. "Before, I never really had an idea of where they were over there, and I think the fact that I didn’t know sped me up a lot. "I felt like I could just be quicker to home plate and it wouldn’t matter. But then they just started getting running leads and stealing on my timing." Scherzer, the reigning AL Cy Young Award winner, allowed five runs and seven hits in 5 2-3 innings with eight strikeouts and no walks. He gave up a two-run homer to Ian Desmond and an RBI triple to Ryan Zimmerman. He threw 91 pitches. "I thought overall I threw the ball pretty well," he said. "I just didn’t execute pitches." Strasburg was announced Wednesday as Washington’s opening-day starter. It will be his third straight opener. "I hope my career isn’t just reflected by how many opening-day starts I have," he said. "I think there are a lot of guys in this rotation that deserve it. I’m just the first one out." Scherzer has walked just one batter in 20 innings during the exhibition season. Nationals reliever Ryan Mattheus pitched a scoreless inning in his first appearance of spring training. Mattheus had been out with inflammation of the cartilage in his chest. Though Matt Williams was happy with what he saw Thursday, he admitted there may not be enough time to get Mattheus ready for the opener. Tigers right-hander Anibal Sanchez threw on flat ground Thursday and reported no issues with his shoulder. He is to throw a bullpen session Saturday, and if all goes well, he will return to the mound on Monday against Miami. Sanchez was scratched from Monday’s scheduled start because of inflammation in his right shoulder. Outfielder Rajai Davis (hamstring) is expected back in the lineup Friday. The Nationals optioned infielder Zach Walters, right-hander Christian Garcia, right-hander Ross Ohlendorf and catcher Jhonaton Solano to Triple-A Syracuse. Washington also reassigned right-hander Manny Delcarmen, frst baseman Brock Peterson and infielder Will Rhymes to their minor league camp.